Useage: 200-500y paper and steels. If you like, please share with me some of your pet loads. Not looking for barrel-burners, rather, some doable loads for these ranges. I realise I have my own reaserch to do but with the cost of this ammo I'd rather just break in the barrel and get it close on paper then go straight to reloading to save some costs and time on load devolpment. I have zero experience with this caliber so....not sure of what bullet weight to use etc. I also did a quick search and didn't find any info, my fault I'm sure and things change like recipes, components etc over time so. I've had get fun and scucess over the years relaoding for my pistols and love the feeling you get when you confirm a load and can't wait to get that feeling with this new rifle. Man, nice group. I couldn't hold that tight at 10y w/ a pistol. Should one consider the upper range of bullet weight for my intended ranges/barrel life? Or will lighter ones fly better/use less powder and cause less throat errosion? About all I know is lighter ones bleed off more energy over distance and are more prone to wind dirft. It's an Encore rifle; not a pistol. I doubt there will be a significant difference in barrel life for bullets in the 165 to 220 gr. range. As far as which ones fly better; the lighter ones start faster but lose velocity faster as well. You could do comparisons with a ballistics program but in my opinion, 200 gr. bullets in a 300 Win. Mag. would be near the optimal weight for long range work. It's an Encore rifle; not a pistol. . Copy on the bullet weight info. lighter bullets take more powder. I use a heavy, lower velocity bullet for my barrel break-ins. Yep- yer right...smaller bullet = more case room. Got it backwards. I'm freakin' out over this whole rifle thing... New project, fun fun fun! Heavier bullets offer more resistance giving more time for pressure to build, therefore less powder is needed to get to peak operating pressure. Yeh- I knew that....didn't have my thinking cap on. Takes up more room, makes more pressure, yada yada yada.... multi tasking at work and screwing arond on the computer = inaccurate posts. or even reduced loads (working with rather fast burning powder) ? Aloysius, Pick any cartridge and look it up in any re-loading manual. Now pick a powder that is listed for 2 different bullet weights. You will find that the heavier bullet will use less powder to reach it's maximum velocity. In the small capacity cases you may find some that will come close or equal too but will not be more. 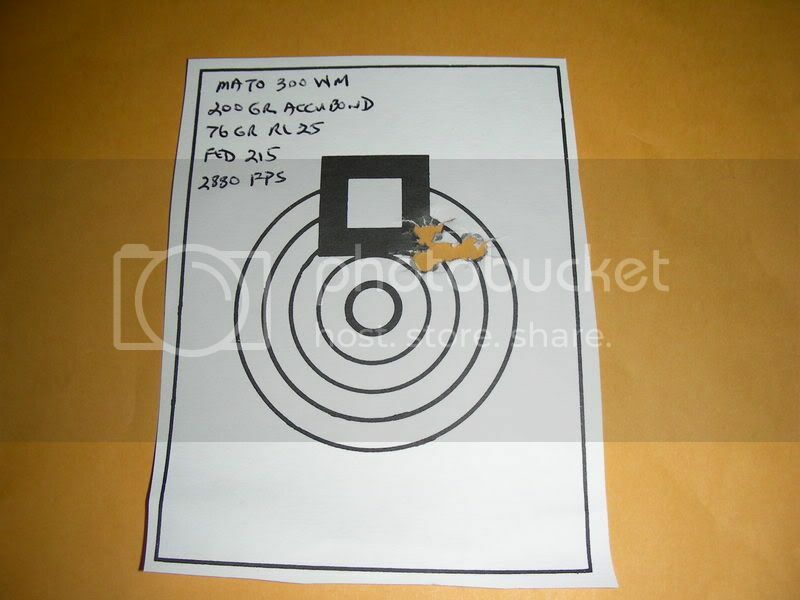 The reason for this is more pressure builds inside the cartridge (of the heavier bullet) before the bullet is released. You basically need less fuel to achieve the same end result. 67, 67.5, 68GR H4831 x (6) each. 3.340 OAL or whatever LEE says. LEE neck only sizer. No shaved bullets on seating. No runout I could detect. 67gr: off the paper, onto cardboard. All flyers. All over the place. Rear scope ring clamp to base was a scoche loose. 67.5: same deal. All flyers. No group or strings. 180gr Federal Game-Shok. 2 shots, back on bull, 100y. Owned all the gongs/swingers at 200, 300 and 400y with tail winds bouncing/rolling off the berms giving others fits. Me and EL Kabong and the mil-dot scope were having some fun. (glad I brought some factory stuff). The wind took my pen down range while tracking settings, lost forever. Sent Sierra an e-mail asking for help. Got 76 of these bullets left and not sure what to do with them or where to start to fix the issues. Got stuck in traffic on the way home- took 3 hours taking an alternate route trying to avoid the Laker parade crazyness, oh yeh that worked too....not. First of all, if your scope was even a little loose, any data obtained with a loose scope is worthless. Your other problem may be your Lee neck sizer. Is it a traditional neck sizing die or a collet die? I've now done testing in 3 different cartridges (7mm/08, 270 Winchester and 300 Winchester Magnum) and those cases sized with a Lee Collet die gave the worst accuracy compared to full length sizing. I also found with H4831SC that there was a narrow range of powder charge that gave optimal accuracy. If all of your testing is from 67 to 68 grains, you could very well have missed the sweet spot; it could be higher or lower; who knows?